These second-graders had already given plenty of thought to their future careers. One student aspired to a career in the arts, and another hosted dreams of teaching. Other members of the class at Highline Elementary School were thinking of jobs in the military and law enforcement, while still others were already formulating plans to enter the world of professional sports and the field of medicine. These professional schemes were hardly accidental. The second-graders in Kristy Quintana's class at Highline had been very purposefully encouraged to think of the bigger picture from the very first days of the 2017-18 school year. As students in the school's ever-growing AVID (Advancement Via Individual Determination) program, the students are on a definite track toward college and career readiness. As the 20-plus students in the school's very first second-grade AVID program, they're taking part in a wider movement that's seen an impressive amount of success in the Cherry Creek School District since its incorporation in 1996. With its focus on essential academic skills like note-taking, effective study habits and organization, the program has offered countless middle school and high school students critical tools to make the transition to college. "This is the first year we've incorporated AVID into second grade, and it's all based around skills known as WICOR – writing, inquiry, collaboration, organization and reading," Quintana said before class kicked off on a warm day in December. "It's all about engagement. The reason why we're engaged every day and the reason they try their best … it's about trying to reach their ultimate goal." To properly put those goals in context, the second-graders have received valuable guidance from Overland High School students involved in that school's AVID initiative. Since October, these high school mentors have regularly visited their elementary school counterparts, helping out with assignments and stressing the importance of clear and definite professional plans. The mentor program has benefited from financial support from the Cherry Creek Schools Foundation, which has contributed $35,000 in tutor funding over the past year. According to Quintana, the feedback has been invaluable in successfully launching the AVID program at the elementary school level. "They're working side by side. It's not only an adult teaching them these skills; it's about a student teaching them these skills," Quintana said. "They see themselves in the students. They see that the high school students are also working on these skills. They're basically getting a head start on these great things." Developed by Mary Cathrine Swanson in 1980 in San Diego, the AVID program started as a way to provide access to higher education to all students, specifically those traditionally underrepresented at the college level. 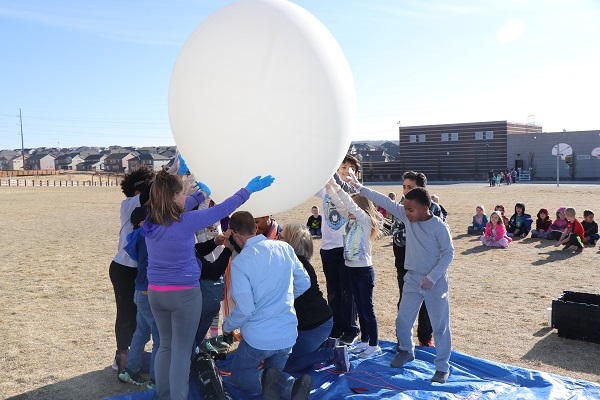 That core mission came to the Cherry Creek School District in 1996, when the district adopted the AVID curriculum in several schools. Since then, AVID has become a valuable resource for students across the district. Every middle and high school in Cherry Creek now offers the program. What's more, Eaglecrest High School, Smoky Hill High School, Horizon Community Middle School, Laredo Middle School, Prairie Middle School and Thunder Ridge Middle School all boast the official status of National Demonstration Schools, an official title that recognizes outstanding AVID sites. "It teaches them not only how to organize themselves, but how to take notes, how to collect their thoughts, how to summarize and reflect upon lessons and prepare for upcoming exams," said Michael Giles, executive director of Inclusive Excellence for Cherry Creek Schools. "The other piece that I really love about it is that it causes kids to think about asking higher-order questions, questions that really extend beyond basic content knowledge and connect to real-world applications." Connecting the experience and expertise of high school students with second-graders just setting out in the program is mutually beneficial, Giles said. "I wish that all of our feeders would do this," Giles said. "For the high school students coming back to work with the Highline second-graders, it gives them a sense of purpose, a sense of leadership and mentorship. They're modeling for the younger students what it's going to look like for them in the upcoming years." That much is certainly true for Aron Tekle, a 17-year-old senior from Overland who visited the Highline classroom in December. Tekle credits the AVID program with his academic success; the program is responsible for his turnaround in classes and has helped Tekle solidify his future academic and professional plans – he plans to pursue a mechanical engineering degree after graduating this spring. Tekle jumped at the opportunity to bring that sense of inspiration and purpose to an elementary-school classroom. "It means a lot to me," he said. "Hitting them at a young age means they learn a lot more quickly … AVID changed my life. It changed the way I think."